For decades, scientists on Earth have sent a plethora of probes into nearly every corner of our solar system to explore planets, moons, comets, and asteroids. What came back was stunning imagery, startling scientific discoveries, and comprehensive maps of worlds many millions and even billions of miles away from us. But where on earth can the average person go to find a sampling of these maps and use them to explore other worlds? One place is Esri’s new interactive Solar System Atlas. Built using the Esri Story Map Journal app, the atlas gathers more than 50 maps into a single app. Starting with our sun, Esri’s Solar System Atlas takes you on an interactive journey to the outward reaches of our solar system to examine many of the most detailed maps available for planets, moons, asteroids, and comets. This geologic map of minor planet Vesta was created based on data collected by the Dawn spacecraft. 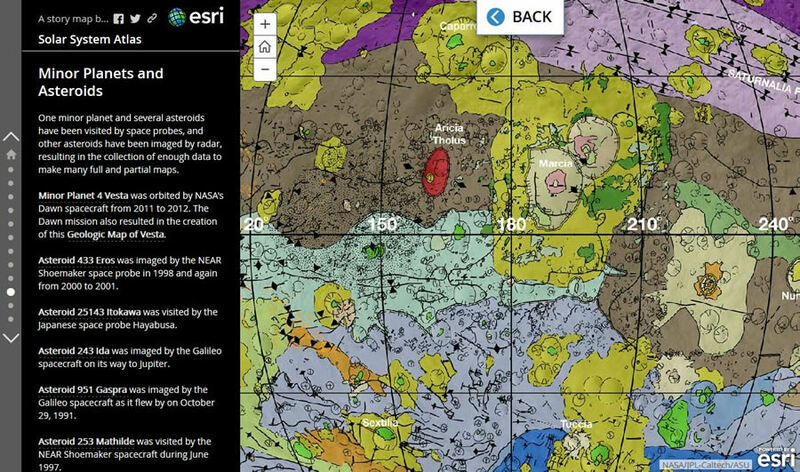 ArcWatch editor Carla Wheeler recently tracked down the creator of the Solar System Atlas, Matt Artz, to ask him to shed more light on this Story Map app. 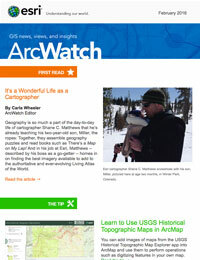 Artz is a GIS and science manager and content strategist for Software Products at Esri. Wheeler: How did you come up with the idea to build an atlas of the solar system? Artz: This whole project started somewhat by accident. 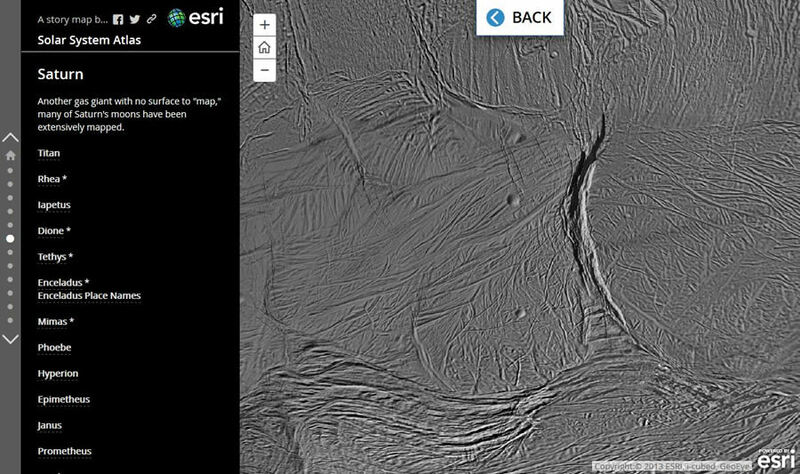 While working on some story maps about Pluto and Mercury, a colleague mentioned that Trent Hare from the United States Geological Survey (USGS) had loaded a number of planetary basemaps on ArcGIS Online. I’m always looking for out-of-the-ordinary ideas for new Story Maps, and I thought it would be real easy to pull 10 to 15 of these maps into a Story Map and call it a “Solar System Atlas.” Then I looked at the NASA website and found a few additional maps, and then a few more, and then … next thing you know, I’ve gathered more than 60 maps from all over the solar system. Wheeler: Exploring with the atlas is like taking an interplanetary ride from Earth all around the solar system to see faraway places like the gas giant Jupiter and its moons, dwarf planets such as Pluto and Ceres, and even comets and asteroids. It’s awesome! Can you tell me more about the maps themselves? Artz: Most of the maps in the atlas are simple images at varying resolutions, are not georeferenced, and have no attribute data attached. But rather than simply displaying them as images in the story map, I wanted some level of interactivity. So instead of just looking at the images, I wanted people to be able to pan around and zoom in and out—to really “explore” all of these planetary bodies. So each image was brought into ArcMap and published as an image service to ArcGIS Online, and then displayed in the atlas as an interactive map. Because of the different resolutions of the source maps, the user experience varies from map to map, but I think it’s a good start at pulling all of this information together into a single app. The Solar System Atlas contains several maps of Venus derived from imaging radar on the Magellan probe. Wheeler: So beyond the atlas itself, each of these maps is available on ArcGIS Online? 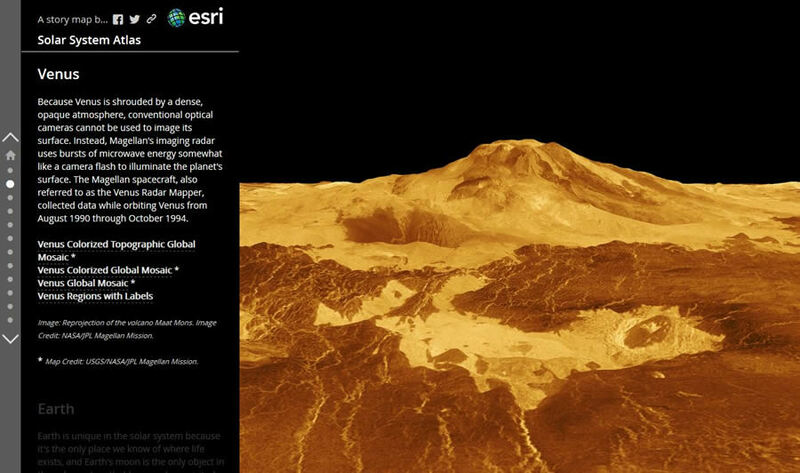 Artz: Yes, the individual maps are already accessible on ArcGIS Online, which means they are available for public use for a variety of applications other than the Solar System Atlas. You can find links to each map and more information about them by following the introductory section of the atlas. It’s going to be fun to see the creative uses that people in the GIS community find for these maps! Wheeler: Who do you think will use the atlas? Artz: The Solar System Atlas promises to be a powerful educational tool for teachers and students, as well as of interest to the general public curious about space, science, and discovery. It’s also a great way to inform the public of the return on investment of space exploration programs. There really is a lot of overlap between “space geeks” and “GIS geeks,” but I’m not sure the average GIS/space geek is aware of how many different bodies in the solar system we’ve mapped. I certainly wasn’t aware of all the mapping that has been done by NASA, the European Space Agency, and other organizations. And it’s really neat to see this technology that was developed for our own planet starting to be applied on other planets. Saturn's moon Enceladus, which is composed primarily of water ice, has been extensively mapped by the Cassini probe. Wheeler: Do you have any future plans for the Solar System Atlas? Artz: I know that more detailed maps are being developed for some planets and other objects in the solar system using new remotely sensed data. And, of course, new exploration of our solar system will continue, such as the Juno probe, which is slated to arrive at Jupiter on July 4, 2016. Also, many of the maps published as simple image services will be enhanced over time. This atlas really just serves as a starting point for something much more robust and comprehensive that could be developed in the future. But for now, it’s pretty cool, isn’t it?